As Acumatica Summit 2019 continues, the Acumatica community has already experienced a blizzard of cloud ERP information and knowledge, enough to energize them for the year ahead. 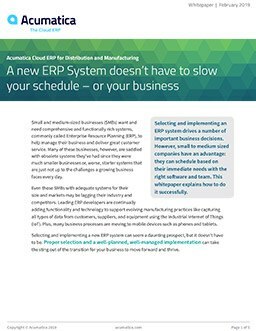 Ranging from practical improvements to electrifying innovations, Acumatica cloud ERP is ready to help you accelerate your business. The first two days of Acumatica Summit 2019 have flown by as Acumatica CEO Jon Roskill and our amazing team shared with over 1,500 attendees what our award-winning cloud ERP solution has in store for the Acumatica community in 2019. Before diving into the Day Two details, Day One had Jon sharing some results from Acumatica’s amazing 2018, including 88% new revenue growth, the addition of 1,200 new customers (bringing us to 5,200 and counting), a growing partner community, and the exciting future growth plans Acumatica has in store. Be sure to check out my post on Day One for the details. Jon and his team inspired attendees with Acumatica’s focus on collaborating, innovating, and accelerating as a community. They addressed Acumatica’s project roadmap and R&D initiatives, sharing that 74% of Acumatica employees are in R&D alone. There is no question that Acumatica is excited about technology. During the Day Two Keynote, technology was the theme. As Jon shared at the start of the Keynote, Acumatica provides, and will continue to emphasize, seamless cross-module workflows, where users can move from one module to another during real-life scenarios without even realizing they’re doing it. He then segued into Acumatica’s Product Roadmap, which Ali Jani, Acumatica’s Chief Product Officer, stepped on onstage to discuss. Ali explained that Acumatica’s product strategy focuses on business functionality, high usability, and ease of implementation, which includes both implementing Acumatica cloud ERP and implementing additional modules. He also explained that what we do and how we do it when it comes to our releases, such as Acumatica 2019 R1, is based on user feedback and visiting customers at their businesses to work on their problems and processes. Doug Johnson, VP, Product Management, took to the stage to highlight new Acumatica 2019 R1 features. He specifically addressed the Project Accounting module, which he called the “hub” for all projects. He presented two scenarios involving Project Accounting and Field Services, one that touched on multi-currency capabilities and rate consistency across Acumatica, and, with Jessica Gadbois, one that allows different users to collaborate in real-time, moving seamlessly from CRM to Project Accounting to Field Service. Jessica, within the same scenario, emphasized the many benefits of using Acumatica’s mobile app, including GPS capabilities, photo-sharing, and capturing customer signatures. She also noted that tab efficiency has been improved in this release. Moving on to Distribution Management, warehouse management functionality has also been improved. Using a scanning device, Doug demonstrated how the added capability of “Receive and Put Away” increased efficiency, both in scanning individual products and boxed items. While there wasn’t time to discuss every enhancement, Doug shared that every edition has been touched by Acumatica 2019 R1. Stay tuned for more details in upcoming posts! Mike walked the crowd through planned improvements to Financials, Inventory and Order Management, Project, CRM, Field Service, and Portals. And, as he explained, behind the ERP functionality is our biggest investment as an engineering company, the Acumatica xRP Platform. The roadmap includes continuing to make platform advances, as well as to improve UI, usability, dashboards & reporting, and more. The vision, Mike shared, is to maintain ERP Technology leadership by investing in and leveraging the single unified development platform and to deliver best user experience and productivity by way of latest UX concepts and technologies, such as AI, Machine Learning, and Natural Language search. After a demonstration, Mike invited Ajoy Krishnamoorthy, VP of Platform & Technology, to present on emerging future technologies. Ajoy noted that we leverage the investments made by other technology companies (e.g. Microsoft, Amazon, Google Cloud, and more) within the Acumatica product set. And Ajoy imparted some exciting news: The Acumatica Cloud ERP Connector for Microsoft Flow is now available! It allows employees, without the assistance of developers, to create and automate workflows and tasks across applications and services, sync files, get notifications, collect data, and more. “We’re excited about technology, but more importantly, we’re excited about applying those technologies to pragmatic solutions,” Ajoy said. With Jessica’s help, Ajoy demonstrated another Machine Learning capability possible through Google Cloud Vision Product Search. Just by taking a picture of her cowboy boots with his smartphone camera, he was able to look up both that boot and similar ones with ease. Manufacturing and field service users will find this particularly helpful when searching for parts or components. Acumatica Summit 2019 would not have been complete without a few tech toys to show how efficiency in the future will look. Ajoy introduced a camera drone, which flew out and scanned the QR codes of shelved warehouse inventory, instantly uploading the physical quantity Acumatica. And he wasn’t done yet! He also used the Microsoft HoloLens to demonstrate hands-free, voice-activated capabilities in a construction scenario. “We’re excited about continuing that investigation and work and see how we can take advantage of the data coming in from devices like that and feeding it into Acumatica,” he said. After these exciting examples, Jon joined Ajoy for an Acumatica Alexa for Business demonstration, showcasing how real work, using Natural Language input, can be accomplished. Looking up inventory to approving expense claims, Alexa for Business can fulfill voice-activated scenarios and improve end-user productivity. It was a great way to end the Keynote. Tuesday wrapped up with Keynote speaker, Mike Massimino. His fascinating and stellar career as a professor, engineer, author, and NASA astronaut (the first to tweet from space) made him more than qualified to address the challenges those in the cloud ERP world face. He spoke on how teamwork, leadership, innovation, and passion helped him address challenges while on his space missions and how the innovative problem-solving he employed in space can be used to solve the challenges faced by earth-bound cloud ERP businesses, challenges such as staying relevant in the digital age and undergoing digital transformation. Hearing about Mike’s experiences and his firm belief in getting back up when life (and mistakes) knock you down combined with a day focused on the exhilarating future of Acumatica cloud ERP made for a great start to the year! As you can see, we’re excited for where Acumatica’s cloud ERP software and ERP platform have been and where they’re going. We’re committed to supporting our customers and partners with continual investment in new technology, advanced product education, and outstanding customer service. If you have any questions about our cloud-based ERP, contact us. And if you missed them or just want a review, the Day One and Day Two keynotes will be available on demand soon. Stay tuned for full recap of Acumatica Summit 2019 coming soon.